Searchencrypt.navigateto.net is the PUP that uses misleading techniques to prevent removal. Use Reimage to locate malicious components and get rid of them faster than with uninstall instructions. A full system scan blocks virus reappearance and prevents traffic to malicious domains. 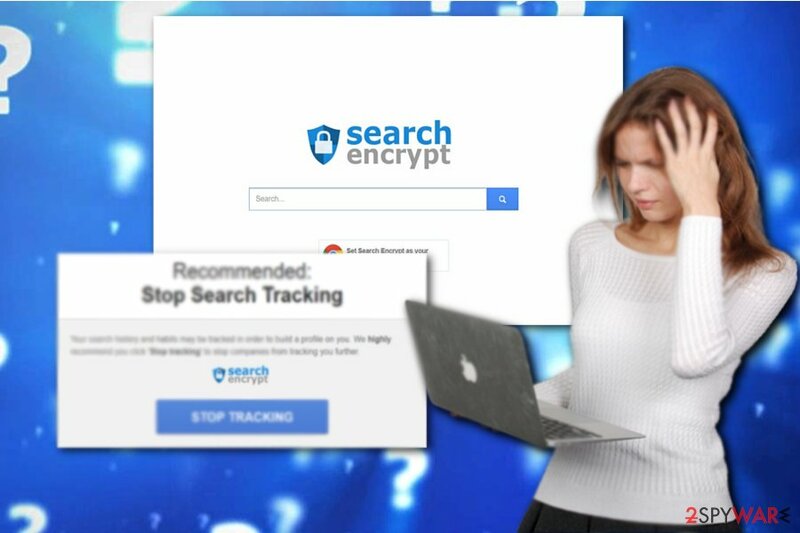 Searchencrypt.navigateto.net virus operates as a web page promoting questionable browser extension which supposedly grants users more privacy – the extension supposedly encrypting the traffic of your browser and thus hiding you from online advertising companies. However, since the topic about the need for anonymity is becoming more relevant, the number of suspicious apps and extensions offering such commodity proportionally increases. The Internet is full of things both, useful and negative. In fact, the latter encompass a significant if not majority of the entire cyber space. This promoted extension sparks doubts especially after continuous reports about hacked legitimate browser add-ons. When Spora 2.0 ransomware launched its the HoeflerText wasn‘t found Chrome scam, it caused chaos among Chrome users. After visiting one particular domain, users would be redirected to another corrupted web page which would display an unreadable collection of numbers and characters. In order to read the content, users were encouraged to install a corrupted Chrome extension. Fortunately, this website does not ask you to install anything, but Searchencrypt.navigateto.net redirect issue should not be tolerated. On its behalf, it may still redirect you to a corrupted website. Once you notice this tendency, initiate Searchencrypt.navigateto.net removal or reset the browser fully. Even though Searchencrypt Navigateto does not directly occupy your browser, the fact that you get redirected to this domain is not a good sign. It may use adware scripts to direct users to its homepage. Such scripts may be injected in gaming or torrent sharing domains. If you want to lower the risk of searchencrypt.navigateto.net hijack, it would be better to avoid such domains. In addition, you should note that similar PUP programs are spread as attachments to free programs. Despite where you have installed a new program from, carefully proceed to each installation stage and watch for additional add-ons. Unmark them before clicking the “Install” button. Since it temporarily occupies your hijacker but is not installed manually, its elimination needs additional attention and precision. 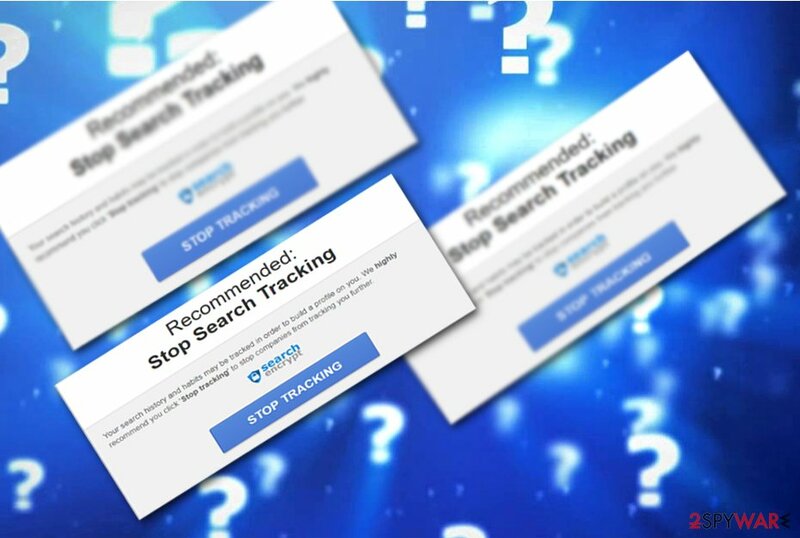 First of all, we recommend you to eliminate it with an anti-spyware tool. If it does not find PUP.searchencrypt.navigateto.net, you may proceed to manual Searchencrypt.navigateto.net removal. Below guidelines provide a step-by-step guide. In the future pay above suggested tips and avoid installing any tools promoted in websites crammed with banners and ads. On the final note, even non-native English users should be wary of the PUP as it might wander in Bulgarian or Greek sites. 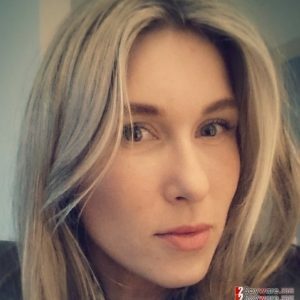 Here, look for Searchencrypt.navigateto.net or any other recently installed suspicious programs. Wait until you see Applications folder and look for Searchencrypt.navigateto.net or any other suspicious programs on it. Now right click on every of such entries and select Move to Trash. When in the new window, check Delete personal settings and select Reset again to complete Searchencrypt.navigateto.net removal. Once these steps are finished, Searchencrypt.navigateto.net should be removed from your Microsoft Edge browser. Here, select Searchencrypt.navigateto.net and other questionable plugins. Click Remove to delete these entries. Now you will see Reset Firefox to its default state message with Reset Firefox button. Click this button for several times and complete Searchencrypt.navigateto.net removal. It would be recommended to perform full browser to fully remove Searchencrypt.navigateto.net virus and its hidden scripts and codes. Here, select Searchencrypt.navigateto.net and other malicious plugins and select trash icon to delete these entries. Click Reset to confirm this action and complete Searchencrypt.navigateto.net removal. Here, select Extensions and look for Searchencrypt.navigateto.net or other suspicious entries. Click on the Uninstall button to get rid each of them. Here, look at the Homepage field. If it was altered by Searchencrypt.navigateto.net, remove unwanted link and enter the one that you want to use for your searches. Remember to include the "http://" before typing in the address of the page. Now you will see a detailed dialog window filled with reset options. All of those options are usually checked, but you can specify which of them you want to reset. Click the Reset button to complete Searchencrypt.navigateto.net removal process. ^ Is it still possible to protect one’s online privacy?. OkanaganLife. Local news and commentary. ^ Ray Walsh. Eight Chrome Extensions Hacked – Including Two VPNs!. BestVPN. Find the best VPNs, Expert Reviews, Comparisons. ^ Get rid of malware. Virusi. Security news in Bulgarian. This entry was posted on 2017-09-14 at 07:51 and is filed under Stealing programs, Viruses. You can quickly scan the QR code with your mobile device and have Searchencrypt.navigateto.net virus manual removal instructions right in your pocket. How did you remove Searchencrypt.navigateto.net virus?